With a small herd of Nigerian Dwarf goats, my family will never be free from purchasing fluid milk. But we didn’t get these little girls for the milk. Nope. We bought them for their butterfat. Nigerians are cheese goats. We’re still in early days, and right now we only have one milking doe, and she’s a first freshener. Our once-daily milkings produce a whopping cup of milk a day. Sometimes more, sometimes less. So, I hoard milk in the freezer and make my cheese and cajeta once quart at a time. 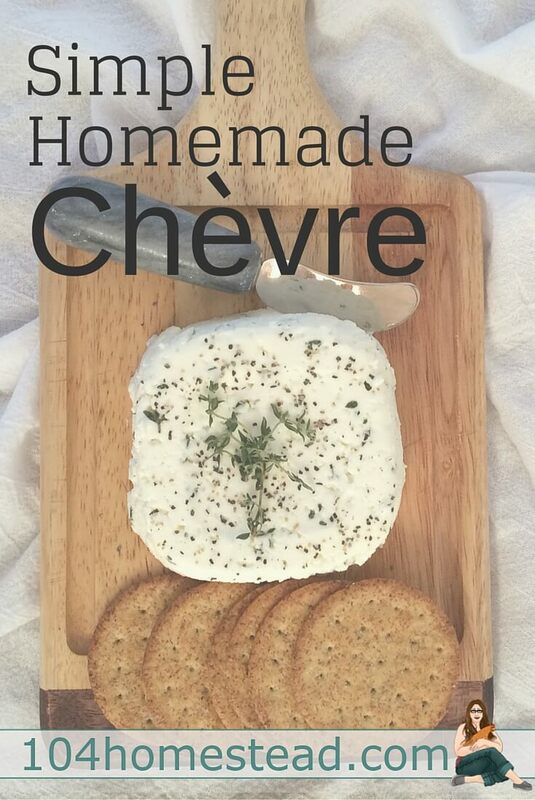 Chèvre is the easiest cheese in the world to make, and it’s very forgiving. Perfect for a novice. To begin, I bought a 5-packet starter culture from everyone’s favorite, New England Cheesemaking Supply Co. This is also where I got my little basket mold and butter muslin for draining, but you could improvise these materials with a colander and a clean cotton pillowcase. One packet sets a gallon of milk, so I use about 1/16th of a tsp of powder for a quart of milk, and mark it off on the packet itself so I know when to buy more. You can store the culture in the freezer for up to two years. Image courtesy of Paring Down, Looking Up. To start, pour your milk into a stainless steel pot and heat up to around 80°F. The packet recommends 86°F, but again, this is a forgiving process and we’re just aiming for room temp. Our milk is raw, so I don’t want to cook out any of the goodness. If you are lucky enough to be using fresh milk straight from the goat, you’ll need to let it cool to the correct temperature. 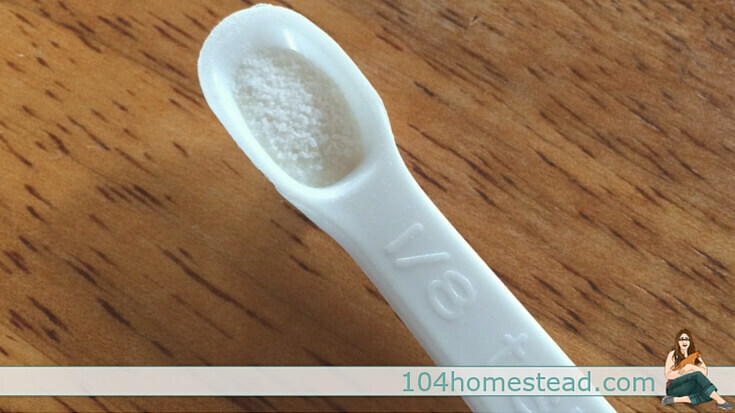 Next, sprinkle your powdered starter over the milk and let it sit for two minutes to rehydrate. Then you’ll stir the culture throughout the milk. I use a whisk for this, but not the actual “whisking” motion. Now put a lid on the pan…and wait. 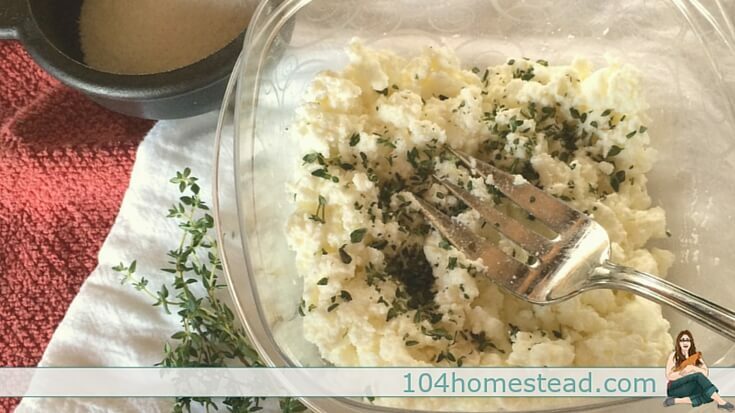 Time is the biggest ingredient when making fresh cheese. 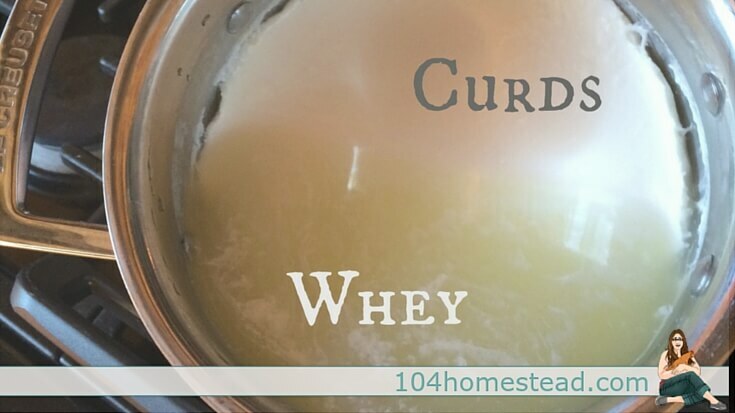 After 12 (or even 24) hours, you should see a snow-colored solid mass of curds when you tilt the pan and pour off the yellow whey. Our cats and chickens LOVE cheese days, as they get the castoffs. Scoop the lovely curds into a muslin-lined plastic cheese mold to drain. I let my cheese drain about 6 hours. I prefer a wetter chèvre, but if you want a thicker, dryer cheese, let it drain longer. TIP: No matter what you read anywhere else, don’t start this process in the morning and then drain the cheese overnight. It is too long, you won’t be there to check on it, and that is how you end up feeding rubbery cheese to your cats. Ask me how I know. The initial 12-hr “waiting in the pot” process can be stretched out to 24 hours without any issues. Once your cheese has reached your preferred consistency, put it into a bowl for seasoning. 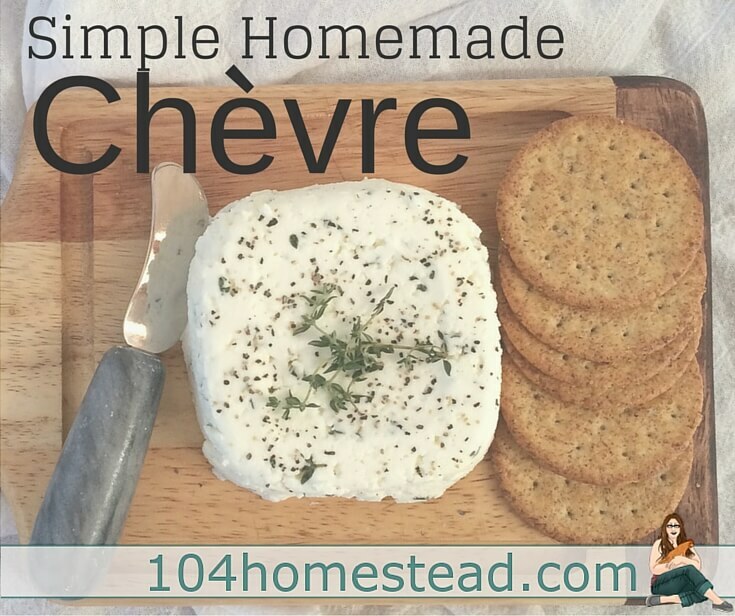 I usually use a serving fork to blend my chèvre with Kosher salt to taste, but this is a guest blog and I wanted to feel fancy, so I added some fresh chopped thyme. Once the cheese is seasoned, you can roll it into a log using plastic wrap and refrigerate, or you can use my ghetto method (there goes fancy), and smash it into a small plastic storage container. Hit it against the counter a few times to release any air bubbles, and then put the lid on and refrigerate for an hour or two. Then, voila! 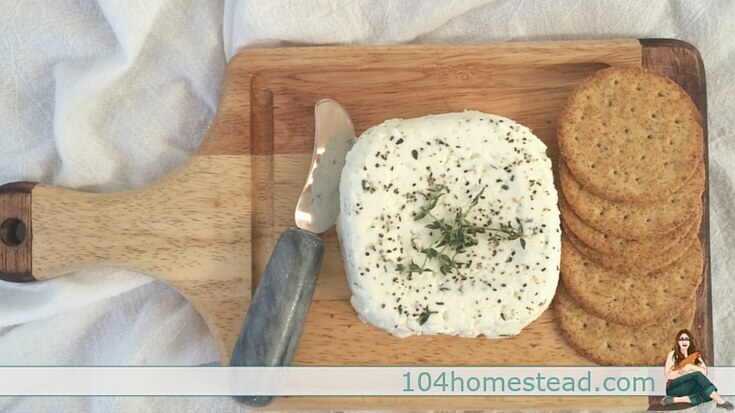 Un-mold on top of a cheese plate, add fresh cracked pepper and a herb garnish and impress your friends. Or, curl up with this pretty plate of delights and eat it all yourself. It’s that good. If you don’t finish it in one go, it keeps for a week in the fridge. Curious about the starter culture. I live in spain at the moment. Can I make my own maybe? Can you freeze milk, and make cheese from it later? If so does it turn out the same? What is the shelf life on the cheese? I love everything you posted about the goats and cheese making. If I can’t find fresh goat milk I will try it with store bought. I’ve always wanted a goat and if I could ever get my home repairs finished after a fire and 2 hurricanes I’m going to find me a little homestead in the country somewhere ( probably Texas ) and live my life off the land. You must be in heaven where you live. Can you buy those little goats in the United States or did you have to order them. Sorry I jabber so much but live basically a lonely life and I love to chat and make friends. Not a silly question at all. You can, but the quality isn’t the same. Homogenization doesn’t affect the cheese-making process, though it may make softer curds. Pasteurization can affect the outcome, but you should be fine as long as it isn’t ultra-pasteurized. Hello! You have no idea how encouraging it was to read this. I have two does, both first fresheners. One of the does lost her baby so we’re milking her twice a day and getting close to a pint of milk. I thought that was on the low end, but I guess it’s all good! The other doe just had her first kid 2 days ago, so we’re giving them some time before we start milking her. Great recipe! yum! 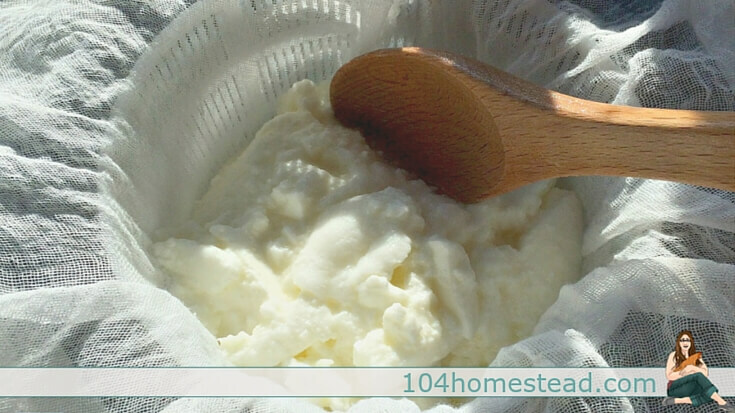 This is similar to how I make ricotta. I’m going to have to give it try.